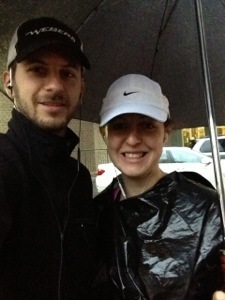 Today’s contribution to Marathon Week will be about running in the rain. For two weeks prior to my half marathon, I obsessively checked the weather app on my iPhone many, many times each day. Each time I checked, the forecast remained the same – RAIN! 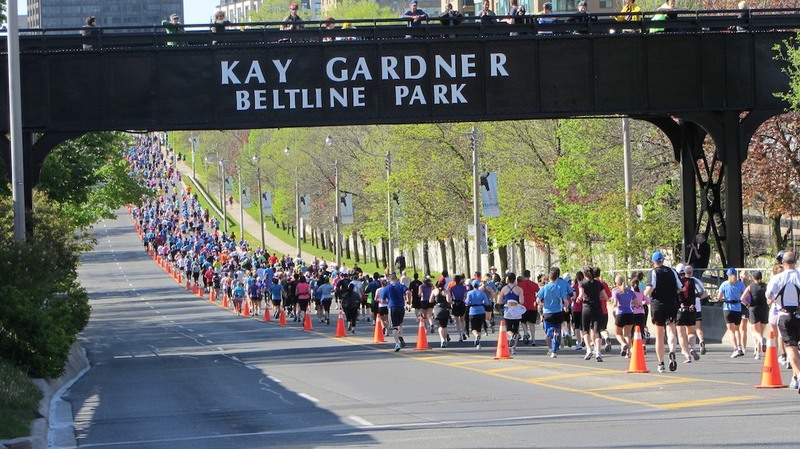 The good news was that the prediction was that the day would be warm (high of 18 degrees Celsius, starting out at 10 degrees at 8:30 am, when the race began). I have run many times in the rain, and I actually find it quite enjoyable. The rain keeps you cool when running. You feel like a real runner when you run in the rain, not just someone who jogs occasionally on the weekend if the weather is nice. So, I had some experience with inclement weather, but I had never completed a long run in the rain. 21km in the rain terrified me. I worried about blisters on my feet, staying warm enough (it was expected to be a windy day), and I worried about chafing from my wet clothing. In the end, the rain was not a problem at all. It was pouring when I left my house, and it continued to rain while I waited in my corral. The rain slowed down to a drizzle as the race started and luckily pretty much stopped after the first 15 minutes of the race. I slathered my feet with vaseline in the morning before I put on my socks. My shoes were soaked within minutes of getting out of my car before the race. They stayed wet for the next 3.5 hours, but I didn’t get one single blister. I put coconut oil on my body in areas where I was worried about chafing. This included my arm pits, and a number of areas under the edges of my sports bra. I didn’t chafe at all! I kept warm and dry before the start of a race by bringing a large throwaway umbrella with me, and by wearing a garbage bag, which I took off just before I crossed the start line. My clothes barely got wet and I stayed warm. I didn’t worry about puddles. My feet got soaked as soon as I stepped out of my car. It would have been very hard to try and run around puddles, and it likely would have wasted a lot of energy. My feet were wet, and I just accepted it, and enjoyed splashing through puddles. I wore a running hat with a brim, which kept the rain off my face during the first part of the race when it was drizzling a bit. I wore a running technical t-shirt and a running skirt. 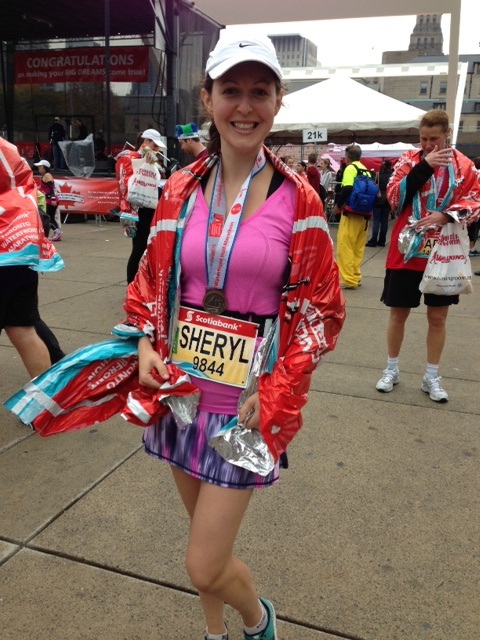 I did not wear a waterproof running jacket, and I did not wear pants or capris. The fabric of my clothes was wicking and quick- drying (gotta love Lululemon!) I knew that the high of the day would be 18 degrees and any extra layers would have overheated me. I saw a lot of people with jackets on at the start, and pretty much everyone took them off. I saw a lot of people wearing long sleeves and long pants and they were sweating profusely. They were really overdressed. Have you ever run a race in the rain? Do you have any tips to add? Categories: Uncategorized | Tags: Half Marathon, healthy-living, NaBloPoMo, Running | Permalink. It’s official! 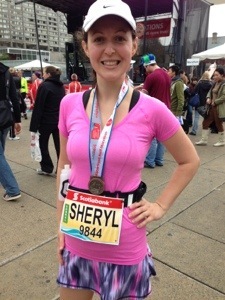 Training for my second half marathon, the Scotiabank Toronto Waterfront Marathon, began last week. Only 14 weeks til the big day – Sunday, October 14, 2012. 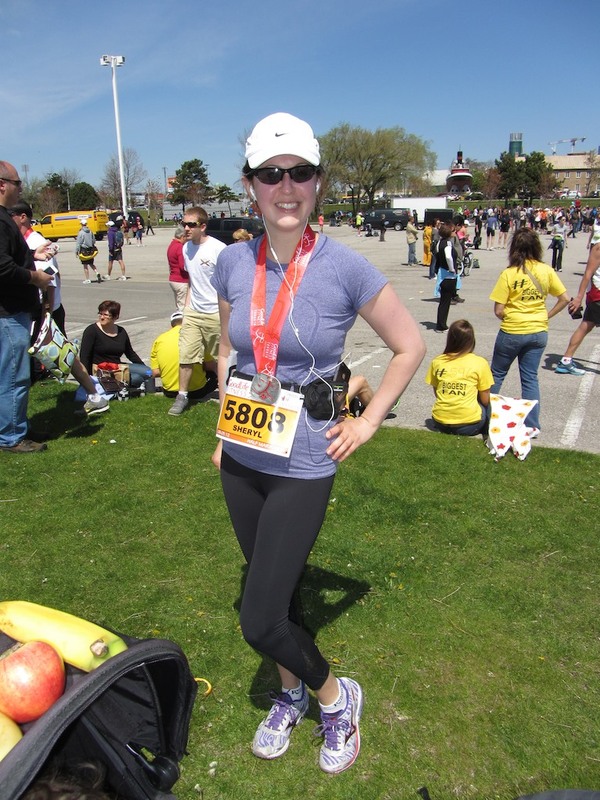 I’ve been running, biking and dabbling in some yoga since my first half marathon, which was almost 2 months ago. I’m excited to get back into some serious training. I had some fun working out my training plan. It is a bit more intense than my first plan as it involves more mileage, and more cross training. I plan on running 3 days a week, biking 3 days a week and resting 1 day a week. I know I need to do some upper body strength training and core work too – haven’t quite figured out when I will do that…maybe on my rest day and one of my bike days? I want to improve upon the time I achieved in my first race, 2 hrs and 36 mins. However, I worry about pushing myself too much and getting an injury. Then I remind myself that there are athletes out there training for marathons and even Ironmans, and a half marathon is really not such a crazy endevour. So I’m going to throw it out there. I want to finish in 2 hrs and 15 minutes. I will re-visit this goal as I work my way through my training plan and adjust as necessary. I will update you, dear readers, as my training progresses. It’s hard to believe that just around this time last year I was just starting to run, training for my first 5k. So much has changed in a year. Categories: Half marathon, Running, Uncategorized | Tags: Exercise, Half Marathon, Running | Permalink. It’s been a month since my half-marathon. Sometimes I still can’t believe that not only did I run 21km, but that I also found time to train properly for it. I’ve been trying to keep up with my running, but I find that it’s not the same without a race looming in the future to motivate me to get out there. 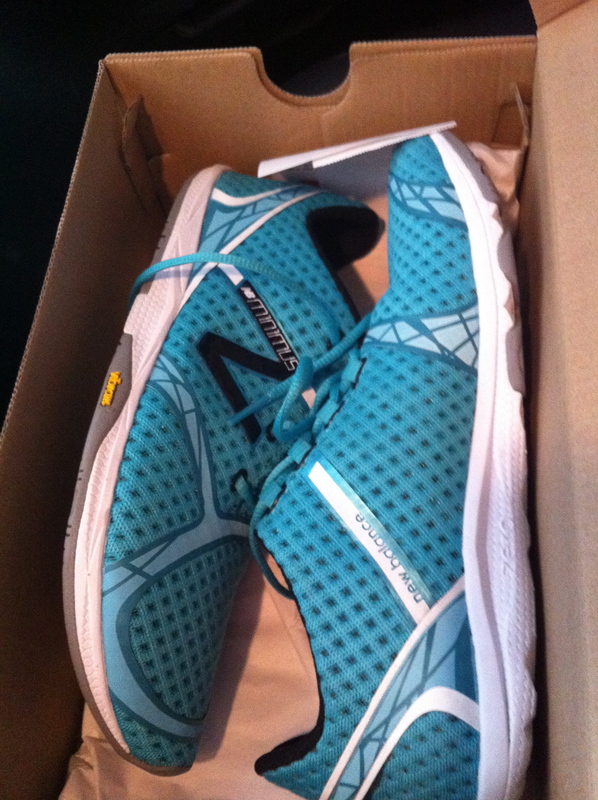 I bought a new pair of shoes which got me running right after I bought them, but their lure is waning. I’ve been experimenting with other forms of exercise, and went to my first Zumba class, which was a lot of fun. It was a great cardio workout and I liked that it could be as high or low impact as you want. I’ve also gone to a few free classes at my local Lululemon. I’ve enjoyed their BOGA class – 1/2hr boot camp and 1/2hr yoga. I realized by going to these classes that I have really increased my fitness level astronomically in the past year through running. The Zumba class and the BOGA class were quite easy for me and I felt so happy about that! I miss the burn and the feeling of exhaustion that I felt after my half marathon. I miss the sense of accomplishment that I felt after the race and that I felt after my long training runs. It’s hard to find time to go out for long runs. 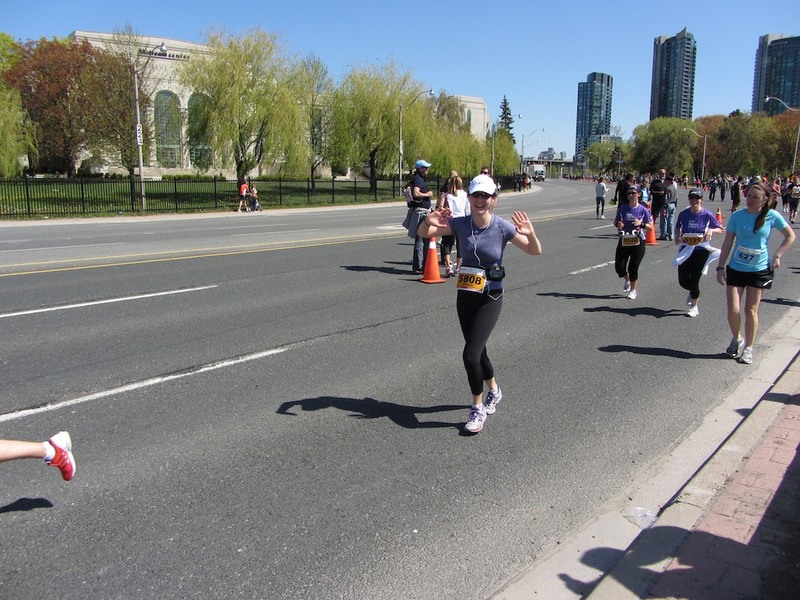 I am definitely going to sign up for another half marathon in the fall. I know that I can increase my speed and lower my time dramatically. Chafing happens – I always read on other blogs that runners experience chafing during long runs. I never experienced this during my training and thought that I was immune to this problem. However, at about mile 11 my armpits started to burn from my shirt rubbing against my skin. The pain was real and I did my best to not think about. Mind over matter, right? However, for future races I will be using BodyGlide. There is no need to experience the pain of chafing. The burn in my legs at mile 11 was pain enough. Refueling after a race is not optional – I knew that I needed to eat after the race and packed up a few things for Jake to bring down to the finish line. This included a scoop of Vega One and some water and a shaker cup, and some ShaSha Buckwheat snacks. However, with all the excitement in finishing the race, I neglected to eat either of these things. I had a banana, a couple slices of orange and that was it. I didn’t even drink water until I got home a couple hours later. This was a terrible idea. I had a splitting headache for the remainder of the day after the race, and I attribute this to not drinking and eating properly right after the race. Employ babysitters post race – the only thing harder than running a half marathon is taking care of little kids after running a half marathon. Jake had a full morning taking care of the boys, and bringing them down to the finish line, and was understandably done with them once we got home. In hindsight I should have asked the grandparents to come over and watch the boys in the afternoon so that I could have a nap and veg out for the rest of the day. Instead, I ran around with them outside, and did other things that did not aid in my recovery. This did not help with my splitting headache. Start out A BIT faster – I wish that I had started out faster. I was so worried about beginning too fast and burning out that I ended up running with people who were….slow. This slowed me down. For example, there was a girl near me wearing long yoga pants, a sweater, a very unsupportive bra, and her long hair was loose. I didn’t get it. It was so hot out. Needless to say, she wasn’t very speedy. 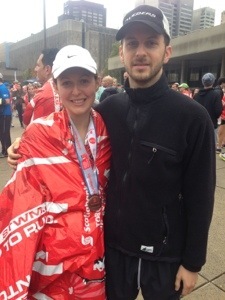 I have no idea how she finished 13.1 miles like that. I wish I had run with people who were faster (and dressed properly), so that I would have been motivated to go faster. Have you run any races? Have you learned any lessons from them?